The biggest win of Emiliano Grillo's career before Sunday was the Web.com Tour title two weeks ago. Now he has a seven-figure win and a spot in next year's Masters. 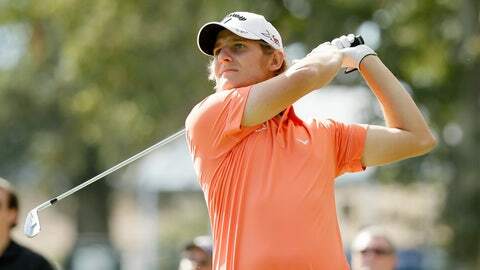 Emiliano Grillo of Argentina won his PGA Tour rookie debut Sunday at the Frys.com Open by holing a 25-foot birdie putt on the 18th for a 3-under 69, and then making the most out of a second chance in the playoff to beat Kevin Na. Nearly as impressive as his closing birdie was the way the 23-year-old Argentine bounced back from a shocking miss. Grillo had a 3-foot birdie putt on the first playoff hole to win and was stunned when it caught the left lip and spun away. Then, he drove into the fairway bunker on the 18th on the second extra hole with Na in the fairway. He used driver off the fairway for the second time and hooked it behind a tree, leaving him little chance of getting his third shot on the green. Na wound up with a bogey. Grillo hit a bold approach shot over the edge of a bunker to just inside 10 feet. Needing two putts for the win, he made it for birdie. Earlier this year, Grillo missed a short birdie putt to win the Puerto Rico Open, and wound up losing in a playoff. "The difference was I hit this one good," Grillo said. "My caddie said, `Are you OK?’ I said, `Yeah, sure. Third time a charm.’ I stayed positive and hit a great shot in there." Grillo has won his last two tournaments in thrillers. He made a 25-foot birdie putt on final hole of the Web.com Tour Championship two weeks ago and earned $180,000. This one was worth a lot more. Not only did he earn $1.08 million, he’s going to the Masters next April. Grillo moves to about No. 36 in the world ranking, which puts him in the HSBC Champions in Shanghai and the Bridgestone Invitational, two World Golf Championships. He’s also in the PGA Championship and The Players Championship, both offering $10 million purses. Na, who got up-and-down with a 6-foot putt on the 18th in regulation for a 70 to force a playoff, told Golf Channel after the playoff ended that he rarely misses driver off the tight fairway grass and that maybe the fact it was getting dark and the ball was slightly above his feet caused him to hook it. Na, who earned $648,000, declined to come to the media room for interviews. Jason Bohn (70), Justin Thomas (69) and Tyrone Van Aswegen of South Africa (68) all finished one shot out of the playoff. Plenty of rookie seasons have come undone early because of injury. But while not everyone let that injury define their career, some sure did. 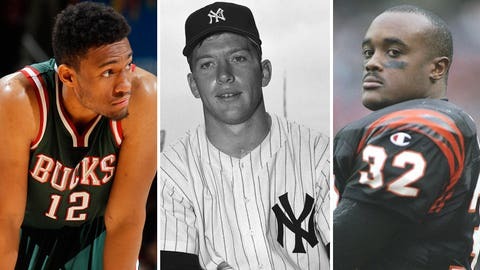 The most memorable rookie injuries, and the careers that became of them. Grillo was the first to reach 15-under 273 with his 25-foot birdie putt. Thomas and Bohn each had birdie chances on the par-5 18th hole. Thomas, who closed with five pars, narrowly missed a 30-foot putt. Bohn sent his fairway metal into a concession area, pitched across the green to 15 feet below the hole and missed it on the low side. Bohn’s bigger mistake was earlier in the round. He was leading at 15 under and was 50 yards from the hole on the par-5 16th hole when he chunked a wedge. His next wedge slid 8 feet by the hole and he two-putted for a bogey. "I was fairly focused on 16 where I just kind of laid the sod over it and chunked it," Bohn said. "There’s times when you think that — trust me — when you’re out there, `Oh, don’t chunk this one.’ But this wasn’t one of those times. Kind of rattled me a little bit. To make a bogey from 40 yards short of the green is pretty unacceptable when you’re trying to win a golf tournament." But then, just about everyone could look back at lost chances. Nine players had at least a share of the lead at some point during a final round at Silverado that was up for grabs until the very end. It started with Brendan Steele, who was trying to go wire-to-wire and was still in position until he hit a poor fairway bunker shot on No. 12. Steele made five bogeys over the next six holes and closed with a 76. Justin Rose was tied for the lead at the turn and was poised to rely on his experience until he missed a 3-foot par putt at No. 12 and dropped two more shots coming for a 72. He wound up three shots out of the playoff. Thomas, coming off a strong rookie season, holed a 45-foot birdie putt on the 13th to get into position. But he missed a 7-foot birdie chance at No. 14 and never got a closer look at birdie the rest of the way, including the par 5s at Nos. 16 and 18. Van Aswegen birdied two of the last three holes to at least have a chance at a playoff until Grillo and then Na each made birdie. The South African woke up to the room spinning, was taken in an ambulance to the emergency room and treated for dehydration, and narrowly got back to the golf course in time to warm up. He was helped by morning fog that led to a 20-minute delay.